I'd been hearing a lot recently about Kosmea's Rosehip oil. Anyone who's ever used it has had only amazing things to say about it, so I thought I'd give it a try. Rosehip oil is the beauty world's latest cult product, its benefits ranging from reducing the appearance of scars and evening out the skin tone, to reducing wrinkles and balancing out the oiliness of skin. 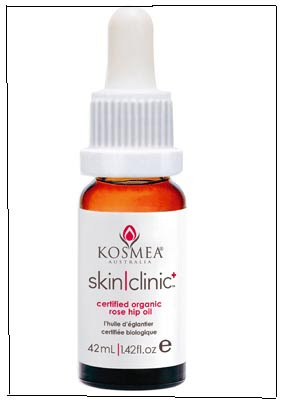 I read from reviews and articles that Kosmea, an Australian company, makes one of the best rosehip oils - being organic and processed without affecting the pureness of the oil. A lot of people have said that this rosehip oil functions much better than other similar oils on the market, and claim to have drastic improvements in their skin tone and luminosity. So I ordered me a bottle of Kosmea's Rosehip Oil, and only just started using it a couple of days ago. I got mine off eBay - where a 15ml bottle is selling for AUD 26.95. It is said to show results within 4 weeks - so stay tuned! I'll be back in about a month to write a little review on Kosmea Rosehip oil and its effects on my skin.